Cyathula root (Niuxi)-Achyranthes bidentata Bl. Part Used & Method for Pharmaceutical Preparations: The roots are dug in winter, dried and cut into slices. 1. Blood stagnation manifested as amenorrhea, dysmenorrhea, irregular menstruation and pains due to external injuries. Cyathula root (Niuxi) is used with Peach seed (Taoren), Safflower (Honghua), Chinese angelica root (Danggui) and Corydalis tuber (Yanhusuo). 2. Deficiency of the liver and kidneys manifested as soreness and weakness in the lumbar region and legs. Cyathula root (Niuxi) is used with Mulberry mistletoe (Sangjisheng), Eucommia bark (Duzhong) and Cibot rhizome (Gouji). 3. Extravasation of blood by heat manifested as vomiting with blood and epistaxis. Cyathula root (Niuxi) is used with Small thistle (Xiaoji), Biota tops (Cebaiye) and Imperata rhizome (Baimaogen). 4. Deficient yin with hyperactive yang leading to internal liver wind going upward manifested as headache, dizziness and vertigo. Cyathula root (Niuxi) is used with Red ochre (Daizheshi), Oyster shell (Muli) and Dragon's bone (Longgu) in the formula Zhengan Xifeng Tang. 5. Deficient yin and excessive fire manifested as ulceration of the mouth and gum swelling. 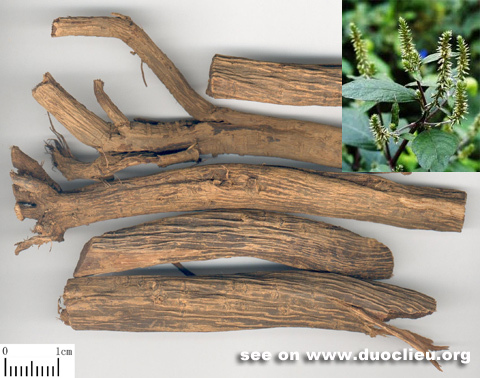 Cyathula root (Niuxi) is used with Fresh rehmannia root (Shengdihuang) and Anemarrhena rhizome (Zhimu). 6. Urinary tract disorders manifested as painful urination, hematuria and dysuria. Cyathula root (Niuxi) is used with Ricepaper pith (Tongcao), Talc (Huashi) and Pink (Qumai) in the formula Niuxi Tang. Cautions & Contraindications: This herb is contraindicated during pregnancy, or with profuse menstrual flow.